Big volcanic eruptions cool the atmosphere for some years due to the aerosols (sulphates) thrown up above the tropopause roughly 10 kilometers up in the sky. 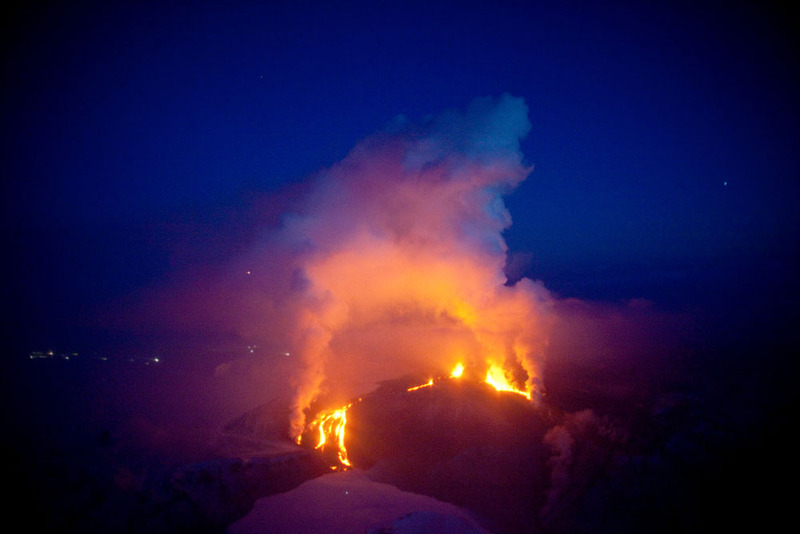 The greenhouse gases from big eruptions may cause changes in the weather for 2-3 years. This is not enough to have any significant impact on climate – the average weather over 30 years. The natural greenhouse effect from the greenhouse gases that are present in the natural cycles warm the atmosphere about 32 centigrades. Without greenhouse gases the mean global temperature would have been around -18 centigrades, in contrast to the present +14 centigrades. So far human activities have contributed almost 1 centigrade in addition, giving the Earth a slight fever. The problem lies ahead with another additional 4-6 extra centigrades when the big climatic feedback systems really hits. Even if we burn off all the oil in the world at once, the CO2 released would, in itself, not be able to cause the greenhouse effect we are talking about here. But this extra fossil-fuel-CO2 will over time cause the radiative forcing needed to let lose the big feedback systems. – The rule is: The initial radiative forcing decides that climate change will happen, while the feedback systems amplifying the original forcing factor will decide the scope of change. d) increasingly warmer oceans that at some point will start releasing greenhouse gases rather than absorbing them. The first is the reduced albedo – reflections of solar light back to space. The floating polar ice now quickly melts away (http://climate.nasa.gov/). Instead of the bright ice and snow, the solar rays meet an open and dark polar sea. In addition the melting Greenland icesheets become darker. This is why the fastest warming on the globe takes place north of the polar circle. The second big feedback system happens when the permafrost in the Arctic melts, releasing vast quantities of methane stored in frozen swamps, and when the methane hydrates or clathrates on the Arctic sea floor are destabilised and released. Methane is a much more potent greenhouse gas than CO2. The extra warming this will cause in turn heats the air enough to increase evaporation from the oceans to the atmosphere considerably. Because of its huge quantities, the strongest natural greenhouse gas is water vapor. A 5-10% increase might have a significant impact. Fortunately, water in the air also has a cooling effect in cloud formation. The bright upper side of clouds has a strong albedo effect. Increased cloud formation, especially in areas where warm and cold air meet, will cool some regions during summer daytime. Typically is the North Atlantic with the warm and moist Gulf stream meeting cooler polar air from an increasingly more open polar sea during summer time. North Western Europe must expect 20-30% increase in cloud formation and precipitation due to global warming. The facts are: humans consume 85-92 million barrels of oil per day and a corresponding amount of coal and gas. A barrel of oil costs USD 80-140. Saudi Arabia, ruled by extreme wahabist islamists, sells 7-12 million barrels of oil per day. Another 20 million barrels of oil is sold by the other Arab countries all ruled by people hostile to the West and to their own populations. The fossil energy market is global. Every time you put petrol on your car you support a system that sends money to extreme, violent and corrupt regimes. The profits are shared with the biggest companies in the world: Aramco, Exxon, Caltex, Gulf, Mobil, Unocal, Chevron, Shell etc etc. Its no wonder that the Koch brothers and other fossil billionaires, the Ibn Saud Family, their friends in the American oil companies are willing to do anything, including fabricating a lot of disinformation about what is happening to our common climate. They blame anything or anybody- volcanoes, God, nature, the commies, whatever, but NOT the coal and oil industry. We do not need more reckless irresponsibility. We need more social cohesion, resilience and an eco-economy taking care of nature and humans. We need a transformation to the sustainable society – now! This entry was posted in Denialism, Environment and tagged climate and fossil fuels, climate change and conspiracy theory, Climate change deniers, Climate change manmade?, Climate change natural variation or human made, volcanoes and climate change, volcanoes and global warming. Bookmark the permalink. 5 Responses to It’s the volcanoes – or is it? Thanks. We all need to contribute. The climate march in New York was a great inspiration.